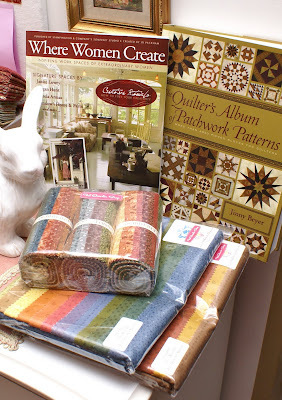 These treasures arrived in the mail on Friday - some new fabric and two great books. Got them just in time too. My 24 year old son arrived here sick with the flu on Saturday afternoon so, while he sleeps, there is lots of quiet time in our house this weekend - perfect for reading. Lots of yummy stuff! I have my eye on Jinny Beyer's book. Does it have full size templates of each block? Oh yes please, tell us about the Jinny Beyer book! I don't think it's reached us yet and I'm desperate to know what it's like. I love the fabrics - which range are they?